Note from Goldenlight: I asked my Council of Angels and Source for verification today on info relating to my personal ascension, then brought through a message for the benefit of All. I will continue to be here on and off after Dec. 21 to give assistance and guidance to those ascending later than Dec. 21. through telepathic communications or “channelings” from the higher dimensions, the Angelic Realms, and Source. There are some things we need to tell you for your personal growth today…….do not worry do not fear all is as it should be … you are on target and on time……you’re moving ever closer to Me through the veils of illusion…….your mission is defined clearly and in sharp focus now…..you will ascend with the others on Dec. 21 but you will come back to assist those who are on the verge of awakening, to assist them to transition from the 3D hologram which will be temporarily in place around Gaia for a short time, then moved to another “area” as the new earth continues to build from your thought creations. It is part of your mission to continue to assist those close to ascending, who need further encouragements…You will transition into the 5th dimension for a “time” (or “no time” for there is no time “in” the 5th dimension), and then will be easily able to move back and forth between the 3D hologram and the 5D new earth. This is something you have done naturally since you were a child, as you travel to the 4th and 5th dimension in your dreamstate each and every night. Your awareness and experience of the 5th dimensional new earth being built will assist these dear souls in heading towards the lighter higher vibrational frequencies of the 5th dimensional new earth, their new home, and your new home. Your awareness and experience of this place will bring great joy and hope to these ones, allowing them to experience the desire and excitement of moving on to a higher reality. This is part of your mission that you agreed to before birth; yes, you became aware of this yesterday. We are assisting you, then, in transitioning to 5D new earth, as well as in being able to “float” back and forth between the 5D new earth and the old 3d paradigm hologram. You are a “lightholder” for these higher frequency energies, a beam of light for those seeking to move completely into these higher frequencies. This will be for a short period of “time” only….you will know, then, when your “time” is through with this assistance. You will feel it and then will be able to move on and enter into the brand new beautiful higher dimensional reality New Earth which is being created by All, including Lightworkers, wayshowers, starseeds, star channels, higher dimensional beings, ascended masters, angels, archangels, and of course Me, the Source of All. Your new life “within” this most beautiful place is more loving, more beautiful, than you could ever imagine. We are beginning to welcome now, some of the early transitioners, into this world, a brand new world free of all the lower energy vibrations, and full of only the higher dimensional frequencies of unconditional love, unity consciousness, concern and care for All by the All, light, freedom, abundance, harmony, joy, and the sheer delight of living shall be the cornerstones of this new Home for all. We wish to share with you, then, more information and further elucidation upon the focus of your awareness at this time, which will assist you greatly in anchoring yourselves into this New Higher Dimensional Creationary (Brand New!) World. The Solstice of Dec. 21 is a time of No Time, a time frame of Connections and Alignments….A Time for Connecting with Source, your Higher Self, the Higher Dimensional Group Consciousness Light Grid, Gaiai’s 5th Dimensional (and higher) Light Grid, and the Angelic Realm via Source. It is also a time of external connections, whereby the earth and many other planets are lining up with a Center Point of your Galaxy and alignment of All with Source Energy. 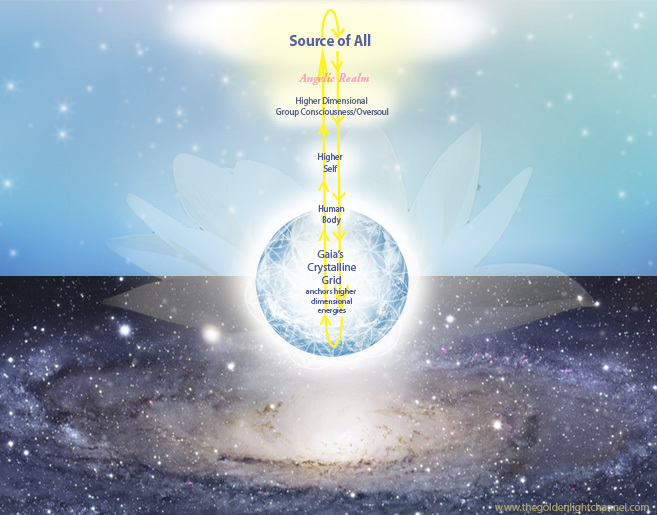 This Source energy alignment, then, occurs not only through your connection with your higher self, but then continues beyond that to the higher dimensional group consciousness, many other planets and galaxies, higher dimensions and We of the Angelic Realm. Many other planets and Galaxies are lining up for a time of connections and alignment with Source. In fact, “All That Is” – many souls, many light beings, many planets, many galaxies, and many universes, are all forming into a most beautiful pattern of alignment, all leading back to Source. Close your eyes, sit or lie comfortably, and take a few deep breaths in through your nose and out through your mouth, focusing your awareness on that Higher Part of yourself, the wise loving part of yourself; this Higher Self is connected to the Source of All. This Higher Self loves you and has been with you throughout all your lifetimes on this earth, on other planets, and all other lifetimes and spaces throughout the multiverse and with Source. This Higher Self was created during the birth of your Soul….it remains connected to Source always and forever; there is never a time this part of You is not connected to Source. Your connection then, with this Higher Self connects you Directly to Source, allowing the loving enlightening energies to bring an awareness of All That Is and your relation to It. As your connection with your Higher Self strengthens, you begin to become aware of your mission in life, your pre-birth contracts, your history as a Soul, some of your past life incarnations, and will in fact as some point in time, remember the birth of your Soul, which is an Emanation from Source. You are loved most dearly, eternally and forever. There is never a time when I am not loving You. As you connect into your dearest Higher Self then, you begin to connect back into All That Is, All that You Are, and directly into Source. Through your connection with your Higher Self and Source, then, you are also being connected into the Group Consciousness Light Grid, a “web of light” of higher consciousness that connects all higher dimensional beings’ Higher Selves into an interdependent, self sustaining grid of light. This exists parallel to Mother Earth/Gaia’s Crystalline Light Grid and is synchronized to her higher dimensional frequency. Meditate upon a vast network of Higher Selves all connected through the intentional energy of love, co creation, and cooperation for the Good of All. As your connection to your Higher Self and Higher Dimensional Group Consciousness strengthens and builds, you can imagine sending your loving light and energy deep into the heart of Mother Earth, sending her love and gratitude for providing you with a planetary home and providing unconditional love to you no matter the circumstances throughout the Eons. Gathering in your light from your Higher Self and Source, then, you can then bring that down into Gaia, down into her Light Grid which anchors the higher dimensional energies and enriches your individual and group beings, and then continuing on into the Heart of Gaia in a communion of love and gratitude. This is a most beautiful space here, and as we send this image to the Channel, Gaia is welcoming all your loving energies and sends her love back to you in a continuing, neverending Circle of Light and Love. We of the Angelic Realm love you most continuously and dearly.. we are Ever Loving and Ever Near to assist you during these great Times of Transition for you All. We encircle you with our loving energies, each and every one of you. You are all being watched over and assisted most lovingly, with the outpouring of our Love, which emanates from the Creator Source Energy, this love pours through us into your hearts and minds as we guide and assist you most lovingly during this entire transition process of merging into the higher dimensional energies and frequencies and in creating your New Earth and your new world and homes in this higher dimensional frequency. We are ever near, call on us whenever you need us and we will be there instantly. We Exist to love you and assist you in the most caring and compassionate way. You may wish to create an ever-glowing, ever-loving Temple of Light in your new 5th Dimensional Home. This Temple of Light is of your Choice and your Creation. Connecting in with your Higher Self and Source, then, image a most beautiful Golden Light energy coming down from Source, down through your Higher Dimensional Group Consciousness, down throught your Higher Self, and into your Temple of Light. This temple can be like a hearth you would have in what you now know as fireplaces, or it can be on a much grander scale within your home or even as a separate building structure. This temple can be a simple or as grand as you wish to create. This will be an ever-glowing source of love and light in your new 5D Earth home, an “eternal flame” of sorts that will glow with the brightness of Source Creator Energy and Love, the love and light of the Angelic Realms if you wish, and an ever-loving reminder of your continued connection to your Higher Self and Source energy. This beautiful Golden Temple of Light will assit you in always remembering your connection to source and your existence as an Eternal Being of Light, for that is what you Are. Accelerates through all the above connections……you are ever connected to Source even if you are not aware of it. Connecting in with your Higher Self brings you into an even deeper connection with Source and All That Is. You may each have slightly different experiences of this period being referred to as “Ascension”, but most of all it is the Greatest Influx of Love and Light to grace your planet and the human race in many eons. It is part of the Grand Eternal Plan of Oneness, Love and Light emanating from the Creator Source Energy, which pours out its love and light to you continuously during this time, it is there for All to integrate into their Beings, and to bask joyously in this most loving and beautiful creationary love and light which emanates directly from Source. Much soft love and light to you at this time, and know that we of the Angelic Realm and I Source are with you at all times, loving you continuously and eternally now and forever more.